Dedric - Continuing to play at an incredibly high level. Grimes - Seemed to be coming around before the Iowa St. game. Poor games the last 2. McCormack - Self seems to be using him about right. He has certainly delivered in the limited minutes. Garrett - Probably a victim of the rating system. His ratings do not do him justice. Having said that, his lack of being a shooting threat does hurt him. KJ - Brilliant or bust? He is either really good or pretty close to worthless. Yesterday was brilliant. Let's hope that sticks for 5 more games. Mitch - Finally back after 5 bad games. Moore - Why does he play? Imagine DM will play more vs Auburn, since they have some bruisers. IMHO, Moore plays to give Dotson a breather. Moore had a nice drive and dish yesterday. Unless he makes his first shot, better off not shooting. 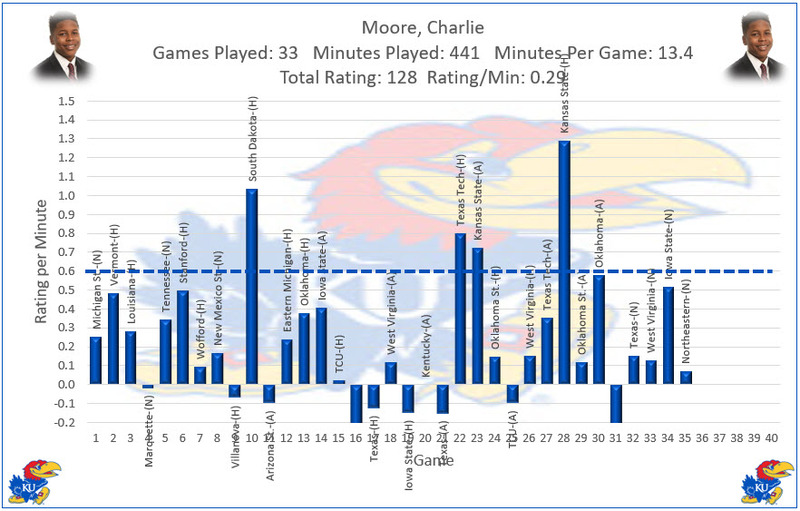 I do not see the C Moore graph and of course I wanted to see more. He has had 6 really strong games, 5 acceptable games, 4 bad games and 20 really bad games. I am really happy with the play of Devon Dotson. 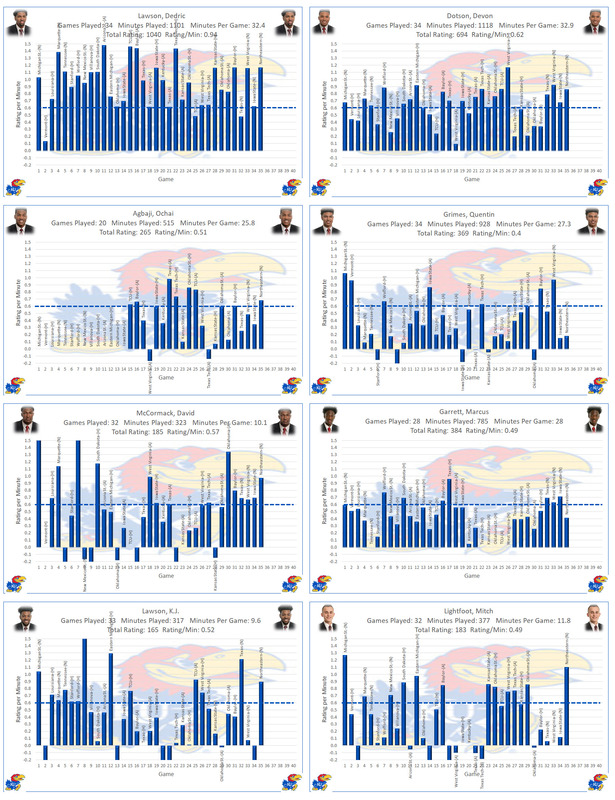 HCBS asks a lot of the point guard and I remember where Frank and Devonte were as freshman. I think he is further along than either of those guys were at this point..